There used to be this bottle of yellow stuff on my grandmother’s table, to be served with meals. It was poured on greens, fries and most importantly the bengali cure all snack food called chop. I was not especially taken by its appearance and certainly did not think much of its taste. As with a lot of the finer things in life, the taste develops and evolves as we get older. Last summer, I had made Kasundi at home for the first time and my husband was hooked as were the people who sampled this fiery and sharp relish for the first time. I made this today, to be eaten with chops and I shall share my recipe for my fish chops later, but for now here is a perfectly simple and servicable to satisty most cravings. Now, in this recipe, I do not add in turmeric, hence the paler color. But, if you wish you can add in about 1/2 a teaspoon of turmeric. In this recipe, I have converted this into a refridgerator pickle of sorts, so this will improve with time. Now, back to the mustard relish, the recipe here is the plain vanilla variety, the traditional one is sometimes made with green mangoes and then there are more creative versions made with tomatoes. In fact, I have made a mental note to actuall make a tomato kasundi this summer. We have just started the backyard operations, the husband has been hard at work this week, getting his seedlings started. One of my disappointments this week was not being able to be at home more for winter break, I am however scheduled to be off most of spring break which is not bad. 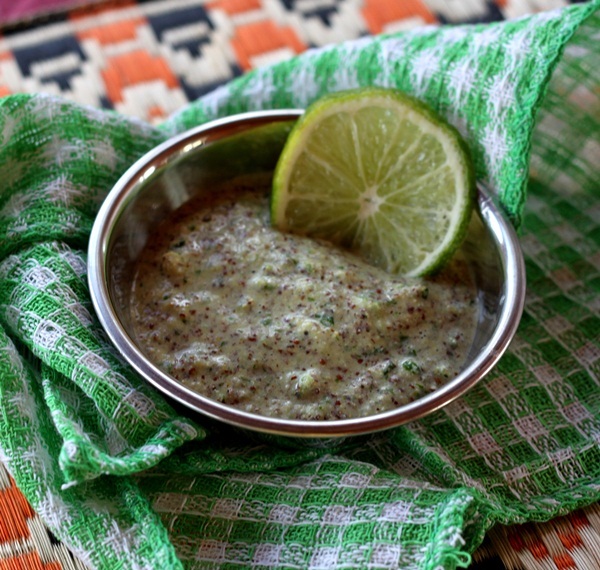 A variation of Kasundi, a classic Bengali mustard relish. Soak the mustard, water and chilies for about 8 hours. Place the mustard, water, chilies, salt, garlic, ginger and sugar in the blender and blend to a smooth paste. Cut the lime and squeeze in the juice and add in the cider vinegar. Serve as needed, or place in a glass jar and store in the refridgerator for 2 weeks before using. This will keep well up to six months in the refridgerator.